Prospects for lasting peace may depend on the oil company's dubious pledge to clean up its act. GEORGE ESIRI/REUTERS A woman dries tapioca at the site of a gas flare near Warri, an oil hub in the Niger Delta. Alagoa Morris sped toward Ikarama as soon as he got word of the fire. He took a taxi from Yenagoa, the capital of Nigeria’s Bayelsa State, to the Imbiama Junction, where he rented a motor bike and raced down the narrow roads to Ikarama. From miles away, he saw a column of smoke towering above the small rural community. It was March 1, 2009, and Morris, a project officer for Friends of the Earth Nigeria, had received an urgent message that a fire had broken out at the site of a major oil spill. The spilled crude, which had streamed from a Shell Petroleum pipeline into the nearby Oya and Obrun lakes, had been sitting for months. When Morris arrived in Ikarama, he found that the site he had been pressing Shell to clean up was in flames. “The fire gutted all the plants and trees around the two lakes and was burning even on top of the water,” he recalled. Since June 2008 Morris has documented nine spills from Shell facilities in Ikarama. The spills have contaminated the town’s main source of water, sickening children and killing many of the fish the local fishermen rely on. The March 1 blaze, said the Rev. FearGod Kologa, a pastor and respected community elder, destroyed plantains, cassava and cocoa yams on his property. The damage in Ikarama is part of a swath of environmental devastation surrounding the operations of Shell and other multinational oil companies throughout the Niger Delta, the oil-rich southern region of Nigeria. Brushing aside regulation by a government that depends on oil extraction for 80 percent of its revenues, the oil majors act with impunity as they employ methods long since abandoned in the developed world. In turn, the government, a majority stakeholder in many joint-venture agreements with energy firms, fails to enforce the law as it spirits vast oil profits out of the Delta. Local communities, mired in poverty and pollution, have increasingly resorted to crime and militancy characterized by destructive attacks on oil facilities. The result has been the wholesale contamination of a region that is home to some 31 million people, most of whom depend on the natural environment for their livelihoods. In recent years, the toxic combination of poverty, pollution, corruption and the federal capture of oil revenues has spawned a violent rebellion led by the Movement for the Emancipation of the Niger Delta (MEND). Last summer MEND’s attacks on the oil industry crippled production and threatened to bring the Nigerian economy to its knees. In August, the shaken government launched an amnesty program for rebels and opened negotiations on the militants’ demands, which included a greater share of oil proceeds for the Delta. The amnesty led to several breakthroughs: in October the government proposed to grant a 10 percent stake in oil revenues to Delta communities, MEND declared an indefinite cease-fire and Nigerian Defense Minister Godwin Abbe told reporters that more than 15,000 rebels had registered to demobilize and turned in their weapons. The effects of the amnesty have raised hopes of a peaceful solution to the region’s longtime woes. But looming behind the advances remains the daunting challenge of translating these gains into a new way of doing business in the Delta. The same cast of characters from the region’s half-century-old drama of contamination and violence–Shell and transnational oil firms, Nigeria’s corruption-plagued government and the Delta’s aggrieved and impoverished communities–must learn how to play new roles. The prospects of a lasting settlement will rest largely on whether the companies that dominate the region’s economy and its environment can adopt a sustainable approach, and whether the government will compel them to do so. The oil companies’ environmental abuses were first dragged into the international spotlight nearly two decades ago by the charismatic writer and activist Ken Saro-Wiwa. Saro-Wiwa’s nonviolent campaign against Shell’s practices in his homeland, the Delta region of Ogoni, earned him a nomination for the Nobel Peace Prize. But his advocacy led him on a tragic collision course with Nigeria’s military dictatorship; Saro-Wiwa was imprisoned on trumped-up murder charges and executed in 1995. In his final statement before he was hanged, the defiant environmentalist declared that Shell would one day stand trial. “The ecological war that the Company has waged in the Delta will be called to question sooner than later and the crimes of that war be duly punished,” he wrote. Soon after, Saro-Wiwa’s family and the survivors of the eight other activists who were executed with him filed suit against Shell in the United States, charging the company with complicity in the killings. According to Jennie Green, the plaintiffs’ lawyer, evidence included records showing that Shell Petroleum had paid and equipped the Nigerian army units that brutalized the Ogoni community, and testimony that its managing director offered to intercede against the execution if Saro-Wiwa withdrew his charges of environmental abuse–a deal Saro-Wiwa rejected. On June 8, 2009, after almost fourteen years of legal wrangling, Shell paid a $15.5 million settlement. The case, which relied on the 1789 Alien Tort Claims Act, set a legal precedent in establishing liability across international borders and was hailed as a triumph in enforcing corporate accountability for human rights abuses. The publicity surrounding the lawsuit, and the emergence of democracy in Nigeria in 1999, have imposed greater caution on Shell and Nigeria’s military. In 2000 Shell signed the Voluntary Principles on Security and Human Rights, a set of guidelines for corporate conduct jointly developed by multinational extractive companies and leading human rights groups. Communities affected by military violence are increasingly seeking redress in court, filing claims such as the $668 million suit against the government by members of the Delta’s Gbaramatu Kingdom following a brutal military raid last May. The oil companies’ most controversial practice is their continued gas flaring. When petroleum is extracted, natural gas known as “associated gas” emerges along with it. In developed countries, companies capture associated gas for use or reinject it into the earth. In Nigeria, they burn most of it on the spot. A 2007 report by Nigeria’s Department of Petroleum Resources documented 117 flare sites in the Delta, some of them beside rural communities that no longer experience darkness at night because of continuous burning. According to the Canadian Public Health Association, flares contain more than 250 toxins, including benzene, mercury and arsenic. A 2005 study by Friends of the Earth Nigeria estimated that flaring in Bayelsa caused forty-nine premature deaths, 4,960 child respiratory illnesses, 120,000 asthma attacks and eight cases of cancer each year. Flares also contribute significantly to climate change: according to a 2002 World Bank memo, gas flares in Nigeria accounted for more greenhouse gas emissions than all other sources in sub-Saharan Africa combined. 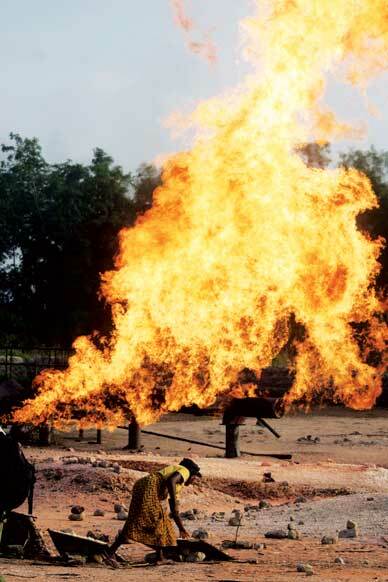 Routine gas flaring has been illegal in Nigeria for twenty-five years, with exceptions for fields that are issued ministry-approved certificates. But Shell and the other oil majors have flouted deadline after deadline for ending the practice. The latest government cutoff date to come and go was 2008; the current target is 2011. In June Oil Change International reported that Shell’s promised dates for ending flaring in Nigeria have shifted from 2005 to 2008, then to 2009, 2010 and most recently 2013. A Shell spokesman stated that the company has reduced flaring by 30 percent since 2002, and that it has invested $3 billion toward stopping its flares. The company maintains that its efforts to end flaring have been unsuccessful because security in the Delta is so poor and because the Nigerian government has failed to pay its share of the costs for the infrastructure needed to capture or reinject associated gas. Both of these are genuine obstacles. But internal documents revealed in the Wiwa v. Shell case show that in the 1990s Shell modeled the effects of ending gas flares by the year 2000. The company’s 1996 Country Business Plan for Nigeria found that “unconstrained flaring” would be more profitable, since abatement is costly and hampers production. While the report stated that the model with unconstrained flares was “solely for reference,” the 2000 cutoff date was soon dropped. Michael Watts, a professor at the University of California, Berkeley, and an expert on the Niger Delta, says the government often issues public orders and reprimands to the oil majors but fails to hold them accountable even for outright disregard of its regulations. “No one believes for a moment that any of this stuff will be acted upon,” says Watts. The other critical source of contamination in the Delta is oil spills. In the half-century following the discovery of oil in Nigeria, the World Wildlife Foundation noted, the industry spilled 1.5 million tons of oil in the Delta, the equivalent of an Exxon Valdez spill each year. Government figures indicate that there are currently 2,472 oil spill sites in the region. These spills often generate protracted disputes over cleanup and compensation. Communities usually blame faulty equipment and demand repayment for damages; Shell claims that the vast majority are caused by sabotage, which does not require compensation by the company. Shell maintains that 85 percent of the oil it spilled in 2008 was a result of criminal activity; environmentalists claim the figure is significantly lower. Companies are obligated to clean up all spills, a job they are often accused of performing inadequately, late or not at all. Four fishermen from the Delta are suing Shell in a Dutch court for its alleged failure to clean up or compensate for spills that killed all the fish in their ponds. Two of the plaintiffs claim that Shell’s cleanup contractor set fire to the spilled crude. On December 30 The Hague Civil Court is expected to decide if it will accept the case, a ruling that will set a precedent on whether parent company Royal Dutch Shell can be held liable for its Nigerian subsidiary. Friends of the Earth Nigeria and local media have also reported five other cases of alleged major oil fires that occurred following spills by Shell. Shell’s spokesman noted that “controlled burning of oily debris in appropriately lined pits is permitted by legislation” but said other cleanup methods are more common. Many Ikarama residents say that the use of fire as a cleanup method is commonplace. Alagoa Morris says he has seen at least six burned oil spill sites in the vicinity. Shell’s community relations officer for Ikarama, Tunde Joel, stated that accounts of fires being set to spilled oil, including reports of the March 1 blaze, are fabrications by townspeople angry at being passed over for cleanup contracts. “In Ikarama, no fires,” said Joel. “Some few people will say there is fire. These are people who are angry at their brothers, so they are busy writing.” Photographs taken by Morris show a massive blaze in Ikarama on March 1. Years of frustration and poverty have repeatedly boiled over into violence. MEND launched a major offensive in June, blowing up oil facilities, sabotaging pipelines and kidnapping oil workers. Shell was temporarily forced to withdraw its personnel from the Western Niger Delta and saw its production plummet to 140,000 barrels per day from its 2008 average of more than 850,000. The offensive brought the cash-strapped government to the bargaining table to try to restore the flow of oil; it began its sixty-day amnesty initiative on August 6. Opportunistic gangs are cashing in on the disorder as well. Abductions for profit have soared in the past year; in October Nigeria’s thirty-six state governors issued a joint statement calling on the government to institute the death penalty for kidnappers. Even Henry Okah, MEND’s most prominent leader, was waylaid in August by armed robbers, who pointed two AK-47s in his face, stole his car and left him and two traveling companions stranded alongside the expressway. The biggest money is in oil bunkering: a massive racket of stealing oil from pipelines and tankers that is believed to include militants, gangs and powerful politicians. A report by the federally appointed Niger Delta Technical Committee found that bunkering cost Nigeria $3 billion in the first seven months of 2008 alone. Most leading MEND commanders have accepted the federal amnesty. By November 30 national oil production had rebounded to 2.4 million barrels per day, about 700,000 more than output during the summer’s conflict. But some Delta activists believe that the cycle of poverty, pollution and conflict cannot be broken as long as the oil continues to flow. Of roughly $700 billion in Nigerian oil revenues since 1960, 85 percent has accrued to 1 percent of the country’s population. Nigeria’s Human Development Index, as of 2005, was on par with Haiti and the Congo. “Oil has not profited the people of the Niger Delta in any way,” says Celestine AkpoBari of the Ogoni Solidarity Forum. AkpoBari believes that no compromise can be reached with Shell and the oil companies following what he describes as a record of continuous environmental and human rights abuses in the region. “They should go and leave our oil under the ground,” he says. If Shell is serious, there are two areas where it can start. First, it must extinguish its gas flares once and for all. The company is making progress toward reductions; in addition to its $3 billion commitment to stop flaring, it recently announced that it had spent $1 billion in the past eighteen months on a project in Bayelsa that will use natural gas that would otherwise be flared. Shell blames the Nigerian government for its inability to meet deadlines and estimates that it will require an additional $3 billion to extinguish its flares for good. But by definition, flaring occurs at sites where oil is being extracted. The price tag quoted by the company for ending its flares in Nigeria represents less than 10 percent of Royal Dutch Shell’s 2008 profits, which soared to a record high of $31.4 billion. Second, Shell needs to revisit its approach to oil spills. Acts of sabotage against pipelines are common in the Delta, but so are failures of Shell’s infrastructure, much of which dates back to the company’s initial expansion in the 1960s. According to Shell data, the company’s equipment and errors were responsible for fifty-three spills in 2008, a total that would lead to immediate action anywhere in the developed world. When spills do occur, Shell needs to clean up its act on cleanups. That means putting an end to the destructive practice of burning spilled crude. It also entails promptly clamping leaks, conducting real remediation of damaged sites and holding contractors accountable for their work. Shell’s routine stonewalling on compensation for victims of spills and contamination remains another major source of popular anger in the Delta. Should Shell fail to act voluntarily, the Wiwa case has wedged open the door for a new means of forcing accountability. Though the Alien Tort Claims Act applies to human rights violations and not to ecological damage, Shell faces a flurry of cases for environmental abuse at tribunals from Nigeria to the Netherlands to the court of the Economic Community of West African States. These cases seek to achieve for the environment what the Wiwa struggle accomplished for human rights: international outcry, putting Shell’s bottom line at stake and ultimately forcing a higher level of caution. The truce that has emerged in the Delta also offers a historic opportunity for the groups in the region to adopt a new approach. Following the amnesty period and federal revenue-sharing proposal, Shell offered to provide demobilized militants with job training and financial assistance to persuade them against returning to the creeks. Shell’s initiative coincides with its efforts to ensure that ailing Nigerian President Umaru Yar’Adua renews its operating licenses. Michael Watts says he is skeptical that the proposals transcend the usual politics of oil money dispensation. But he maintains that for Nigeria, the peace opening represents “one of the most important political moments since the conclusion of its civil war in 1970.” The key, says Watts, is whether the state can develop democratic and accountable institutions to serve the Niger Delta. This role of the Nigerian government is the critical variable in the equation. Protecting the Delta’s environment will require stronger regulatory institutions and a groundswell of political will. A number of bills currently before Nigeria’s Congress seek to raise environmental standards and tip the balance of power away from the oil companies. A bill that would move the gas flaring deadline up to December 2010 passed the Senate in July, and the hotly debated Petroleum Industry Bill aims to reshape Nigeria’s oil industry by creating a state-owned commercial oil company similar to Brazil’s Petrobras. The fate of these bills–and whether they are implemented if passed–will mark critical tests of Nigeria’s independence and willingness to take on the oil companies. One contributor to the government’s efforts is Ken Saro-Wiwa Jr., the son of the slain activist. A special adviser to the president on climate change, he is developing a new legal and regulatory framework to address the climate challenge. Inspired by the results of his fourteen-year legal battle with the oil giant, the soft-spoken Saro-Wiwa is seeking to bring environmental accountability to Nigeria one regulation at a time. Sasha ChavkinSasha Chavkin is a reporter based in New York City. His coverage of the environment has appeared in Mother Jones, Americas Quarterly and Grist.